Cowboys Stadium's 600-ton, $40 million high-definition video screen might be the Super Bowl's most visible piece of technology. (CNN) -- It may not be on the minds of hot-wing-chomping sports fans who want to see Clay Matthews clobber Ben Roethlisberger or Hines Ward streak toward the end zone. But, by all accounts, Sunday's Super Bowl will be the most high-tech ever. From an in-stadium bank of servers storing 100 terabytes of data to an official Super Bowl app for the iPad (which fans will be able to bring into Cowboys Stadium in Dallas), computer technology is almost as integral to this year's game as helmets and shoulder pads. "Essentially, every event we've had here the last two years has been a dress rehearsal for the next event," Pete Walsh, the Dallas Cowboys' chief technical officer,told Wired, a CNN content partner. Opened in 2009, the $1.2 billion stadium, which seats more than 100,000, had technology as a prime focus from the beginning. "When we started this process back in 2004, we were able to meet with different vendors and see their road maps for where technology was going to be in five or more years," Walsh said. "So we were able to take advantage of where technology was going to be rather than where it was." Nowhere is the high-tech take on the gridiron classic more evident than in the stadium's data center: the bank of servers that support 30 organizations and 90 vendors, concession stands and the like in and around the stadium. "As fans at home and at the stadium watch the game, most probably won't be looking for evidence of a virtualized server infrastructure with 100-terabyte SAN core," said Thomas E. Richards, president and chief operating officer of tech company CDW, which assisted the Cowboys with the setup. "Instead, they'll notice how great the game looks from the largest high-definition video board in the NFL or how easy it is to use ATM or credit cards at concessions." The stadium's most visible piece of tech is what's billed as the world's largest high-definition video screen: a $40 million, 600-ton video board with 25,000 square feet of displays. It's 72 feet tall and 160 feet long. And, consider this as you nestle into your man cave. In addition to the monster screen, there are another 3,500 46-inch high-def screens scattered throughout the rest of the stadium. 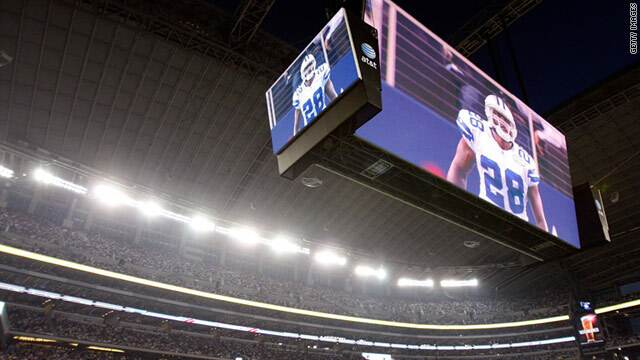 A news release from Cisco, which partnered with the Cowboys on technology, including the screens, called the stadium "the most versatile and technologically advanced entertainment venue in all of North American football." "We needed technology that would provide the ultimate fan experience and enable team operations to run more effectively," said Walsh. "With the new stadium, it was time to upgrade our infrastructure to the next generation and centralize everything in one data center." The stadium's other big technological marvels are its massive retractable roof and 120-foot-high glass doors -- the largest operable glass doors in the world -- although they won't be much a factor during the game. The NFL announced last month that the roof will be closed during the Super Bowl so the league could have a "singular focus" on logistics. As has become custom the past couple of years, Super Bowl officials will use GPS tracking devices to keep an eye on players, performers and even the Lombardi Trophy during their travels to and from the stadium. The stadium will be equipped with free Wi-Fi for the fans in attendance, not to mention the teams themselves and the hordes of media covering the game. All major wireless companies have ramped up their signals around the stadium, too, to make sure their customers don't lose service. AT&T says it has broken data-usage records at every event held at the massive stadium. Cowboys Stadium already has one of the largest distributed-antenna systems in the country, and AT&T has spent more than $10 million in network enhancements there, a spokeswoman said. Sunday will be the first Super Bowl since the advent of modern tablet computers -- in particular Apple's iPad. And the NFL has wasted no time, offering a free Super Bowl app on the device and a similar app for devices running Google's Android system. Geared toward people attending the game, the app (Apple's is also compatible with the iPhone and iPod Touch) includes a 3-D map of North Texas with restaurant and bar locations, a tool to find parking, concessions and restrooms at the stadium, and the ability to see who else is at the game via mobile check-in apps. ESPN and USA Today are among the media outlets that have developed their own game-specific apps. Then, for the millions who really care only about the Super Bowl for its commercials, there's AdBowl. The iPhone app, which complements a website started in 2001, lets users rate each commercial, with real-time results tallied to show which were hits and which ones flopped. "Since AdBowl first launched, we've watched the fascination with high stakes advertising take hold of the nation and not let go," said Steve McKee, president of the company that runs AdBowl, in a written release. "Adding the iPhone app to the mix makes it easier than ever for people to vote." The emergence of social media will be obvious in those big-ticket ads. Audi will make some Web history this year, including a Twitter hashtag at the end of its 60-second spot. Twitter users who use the hashtag #ProgressIs become eligible to win a test drive of Audi's R8 supercar and a $25,000 donation to a charity of their choice. Audi's ad is scheduled for the game's first commercial break. Bridgestone and Mercedes-Benz also are expected to have Twitter tie-ins with their ads. And, in a move they're surely hoping will be more successful than the glut of dotcom ads the Super Bowl saw in the early 2000s (we're looking at you, pets.com), online coupon sellers Groupon have snagged a spot during the game.